See our Facebook Event for More Info. Click Here. Competition is what I live and breathe every day. It’s my way of thinking in life. And I think that is what motivates me day in and day out in the gym everyday! I thank my parents for my competitive discipline. My parents always pushed for me to be involved in as many sports as possible and to excel in all of them. I started swim team at age 5, and went on to play soccer, basketball, field hockey, softball, and ran track. As some points of the year, because I was involved in travel teams, I would be involved in 2-3 different sports at one time, going from one practice to another and balancing my academics on top of that! I was recruited to play soccer for West Chester University, as a starting defender and help lead my team to NCAA’s and playoffs. It wasn’t until my 4 years of college soccer came to a sad end, when I started to get into lifting. I was so used to having practices to go to and games to prepare for, that when it ended I had all this free time on my hands that I didn’t know what to do with. So, I started going to the gym with Rob, who was my boyfriend at that time, and just lifting exactly like he did. I easily became very addicted to lifting. I always wanted to see how much I could max out at and always trying to go heavier and heavier. It was like my own competition I had with myself everyday!! I then entered my first figure competition in 2006 at the Lehigh Valley Championships and competed in figure up until 2010. My goal was to become an IFBB pro; however, I didn’t always do as well in figure. My heavy training and constant desire to put on muscle didn’t always place me very high. I continued to compete, because I enjoyed the competition and prepping and training for shows. It gave me something to work towards and I enjoyed watching how I could transform my body. Nationals of 2010, Atlanta, was my very last figure show before they came out with the new Women’s Physique division, which is step above figure. Since I was always told I was a little too big, too muscular, and too hard for figure, the new physique division sounded like it was made for girls like me!! Girls who loved to lift heavy and like putting some muscle. I decided to do the very FIRST Physique show, which was 2011, JR. USA’s in Charleston, SC. I not only won my class, but I won the OVERALL, received my IFBB pro card, and became the very FIRST WOMEN’S PHYSIQUE PRO in the NPC/IFBB history!!!! I conquered my IFBB pro dream and also became a history first!! I am now in my third year of competing in the IFBB in women’s physique. Last year, 2013, was truly incredible and very memorable for me!! I have accomplished goals and dreams that I never even thought would actually ever happen! With the help of my dear friend and diet guru, George Farah, I made a return to the stage at the 2013 Tampa Pro after taking about a year off of competing, with a much improved physique. After being awarded 2nd place at Tampa, I went on to the Dallas Europa the following weekend and was awarded 1st place and also my number one dream…my ticket to the 2013 OLYMPIA!!!!! It has been a dream of mine for the last 8 years to make it to the Olympia stage. This year that dream came true! Last year was also the very first year for physique at the Olympia and would go down in history. I continued to work with George the next couple weeks on the road to the Olympia. It was a true privilege to even be on the Olympia stage, but for the first ever Olympia for the physique division. There were 16 of the top physique competitors around the world on stage with me and in the very end, I came out on top and was name Ms. Physique Olympia for the FIRST EVER Physique Olympia showdown. I now have become not only the first IFBB physique pro in history, but also the first physique Ms. Olympia!!! There are not enough words to describe all the emotions that go with winning this title. It is such an amazing honor and I will do my very best to represent the physique division to my fullest! This year I spent most of the year traveling the world, doing camps and seminars. This is what I love to do the most! I like to be in front of people and show them and show girls that you can be strong, you can be muscular, and you can be beautiful!!! You can be whatever you envision yourself to be! In the last couple years I have learned a lot about myself and I have learned what it truly means to be comfortable in your own skin. I have learned what confidence truly looks like and feels like…AND and there is nothing greater than that feeling!! So this year for the 2014 Ms. Physique Olympia showdown, I am getting on that stage with 20-some other amazing, beautiful, strong women…and we will get up there together and show the world that muscle can be beautiful too!! Beyond the world of competing…It is hard to believe that about 2.5 years ago we started Flag Nor Fail clothing line, and were printing shirts out of garage. We now moved from a garage in 2011, to a 40,000 square foot warehouse in 2013 and have been here almost a full year! In that year we built The Speed WarHouse, which is our car performance shop that builds monster race and performance cars and also my baby, The Warhouse Gym, where we hold WarHouse Gym camps ever single month. The WarHouse Gym camp is freaking exploding, with special guests and other IFBB pro’s, tons of free samples from over 25 different supplement companies that help to sponsor our camps. It really is amazing to think back to 2010-2011 when Rob and I were just talking about all these things that we dreamed of…and today we are living our dreams and made them a reality! 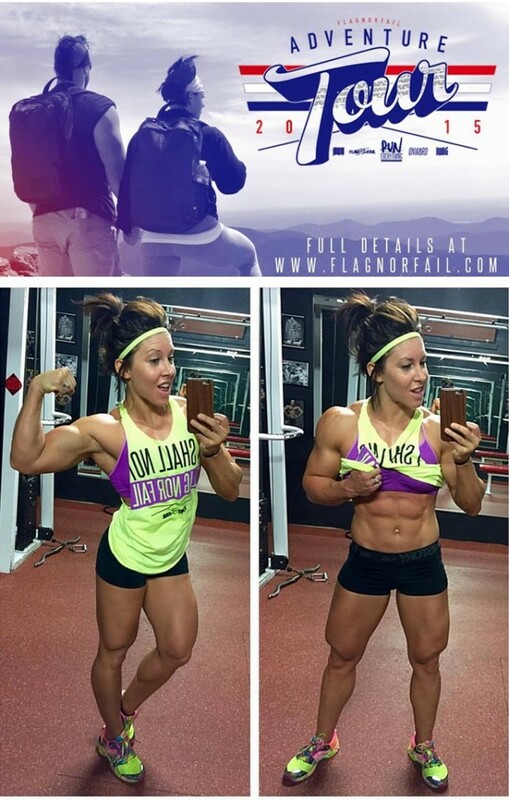 We are the true meaning of Flagnorfail…FlagNorFail is a mindset and a lifestyle! We hope that you can follow our lead and put this mindset into every aspect of your life!!! I am living my dream every single day! It took me a lot of years and a lot of hard work to get to where I am at today as an IFBB professional athlete, a business owner, a sponsored athlete, and also as an inspirational role model to so many people across the world!!! Thank you to all of my fans for all your support that you have shown me. You are what motivate me every single day in the gym and in my life!! I hope I can continue to motivate and inspire you to always strive to be your best and conquer all your goals! I hope to open up eyes and show people its okay to look a little different as long as you are happy and confident with yourself. Confidence is the most beautiful and rewarding asset that anyone can ever poses. So live life, be happy, and be confident with who you are and where you are going!